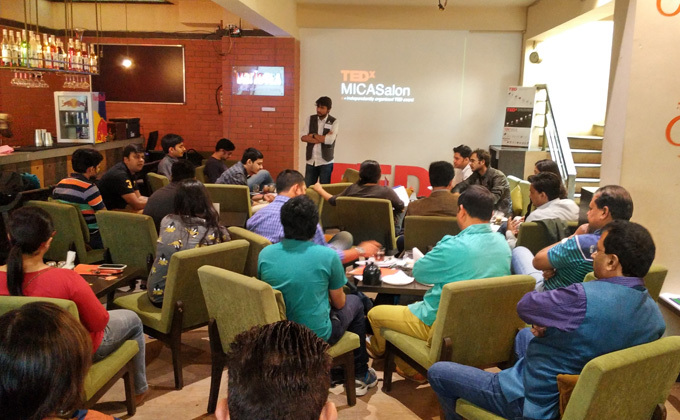 TEDxMICA, the TEDx event organizing committee of MICA, Ahmedabad hosted a TEDxMICASalon event on the 10th of January 2016 at VarieTEA, Prahlad Nagar, Ahmedabad. Interestingly, this was the first university salon event to be held in India. The theme of the event was ‘Serendipity’. Humans have progressed through various inventions and discoveries that took place through a fortunate stroke of serendipity. Be it penicillin, microwave oven, potato chips or coca cola, luck and accidents have always been a companion in the journey of development of human civilization. TEDxMICASalon is a niche event that keeps a community engaged and allows people to converse with each other, before and after a TEDx event, thereby transforming them from passive listeners to active participants in a discussion that has the potential to bring about a change in the society. In this event, invited people came together and were shown curated TEDx talks on which they discussed and learned from each other. The videos revolved around the theme of serendipity. This event was aimed to plant the seed of community learning on the theme of "serendipity". The audience witnessed a mix of opinions from the elders as well as the young on the role that luck and coincidence plays in human lives. "We don't call it Trial and error, but trial and learn" said Mr. Dhruv Gupta who is an entrepreneur. Prof. FalguniVasavada-Oza also shared her views on realigning and refocusing our lives towards the brighter patches. Mr. AvinashGoyal, a business consultant said, "Uncertainty is a part of life and one needs to learn to evolve with it." Ideas like these successfully established the event's idea of getting local community to think on issues in our general lives. As put across brilliantly by the inspirational specially-abled world class snowboarder Amy Purdy in one of the TEDx videos showcased at the event, "Borders are not just where the actual ends, but also where the imagination and stories begin". Towards the end, TEDxMICA showcased the theme "BEYOND" for the TEDxMICA main event, to be held on 7th february 2016, at Mani Ayer auditorium, MICA, shela, Ahmedabad.TEDxMICA strives to bring together spirited people, intriguing concepts and mind-blowing innovations to one platform unleashing new ideas and inspiring the community to help shape the future. We would like to set our 2016 event as a platform and pipeline for the propagation of ideas, energy and creativity to the widest possible global audience. TEDxMICA has previously hosted speakers like Piyush Mishra, Kunal Kapoor, PalaashSen, Moji Riba, and more.